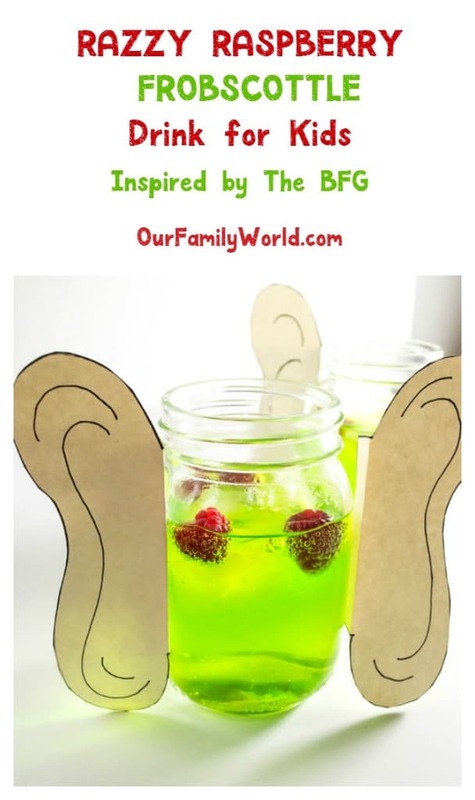 Today we have a fun drink recipe for kids inspired by The BFG! You know how much we love making snacks and drinks inspired by movies, right? Usually, we look to the characters themselves for inspiration. We ask “what would they eat?” and come up with snacks like these Zootopia-inspired paw-sicles made with blueberries. Sometimes we draw from the colors of the characters, like with our Dory-Inspired ice-cream recipe! With The BFG, though, the inspiration was right in the pages of the book! In Roald Dahl’s classic story, Sophie asks if there is water in Giant Country. Instead of water, she’s served Frobscottle, a traditional giant beverage that causes the Whizzpops! I’ll let your imagination figure out what those are! The internet has many, many interpretations on the Frobscottle. Most of them contain ice-cream. We wanted to make something a little lighter and fizzier. After all, it’s the fizz that causes the Whizzpops, right? Let’s check out how to make this fun drink recipe for kids! Are you planning to see The BFG? Do you have a favorite drink recipe for kids inspired by a movie? Share in the comments! You’ll also need either two cups. One for mixing and infusing, and one clear plastic cup or mason jar for the final product. You can mix everything in one cup, but I find that it’s easier to do it this way. Draw two ears on your cardstock paper. You can either freehand them if you’re good at drawing, or you can use a template, like this one. 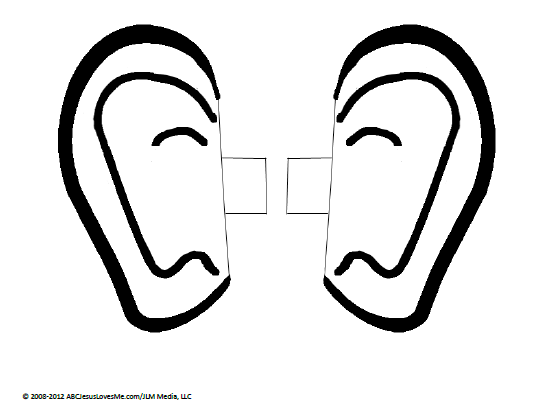 Add details to the ears with your marker, then carefully cut them out, leaving a bit of a tab (see picture). Tape the ears to your cup! Carefully transfer the drink into your finished cup. Remember, club soda fizzes like mad! You can also make a large batch of this in a big punch bowl for a party! Just multiply the recipe by your number of guests. For example, if you have eight kids coming, use 8 cans of club soda, about 25 raspberries (I like to round up) and maybe 6-8 drops of vanilla extract. A little goes a long way with that. If the vanilla flavor isn’t strong enough, you can always add more. Same with the food coloring, just add it drop by drop until you reach your desired color. 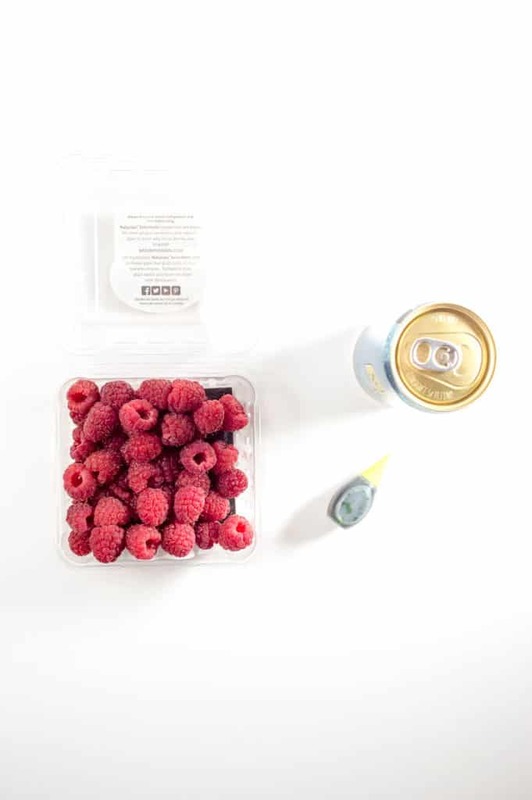 Make it about half an hour before the party; that should be long enough to let the raspberry flavor seep in without the soda going totally flat. 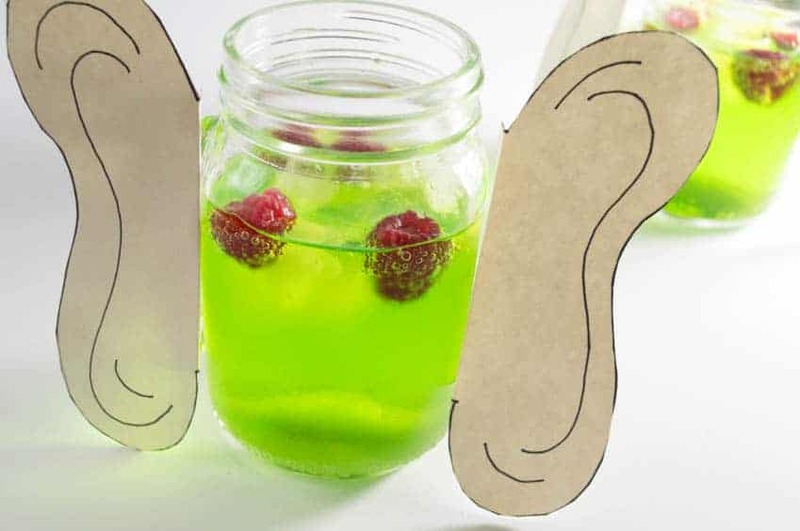 Looking for more fun movie-inspired drink recipes for kids? 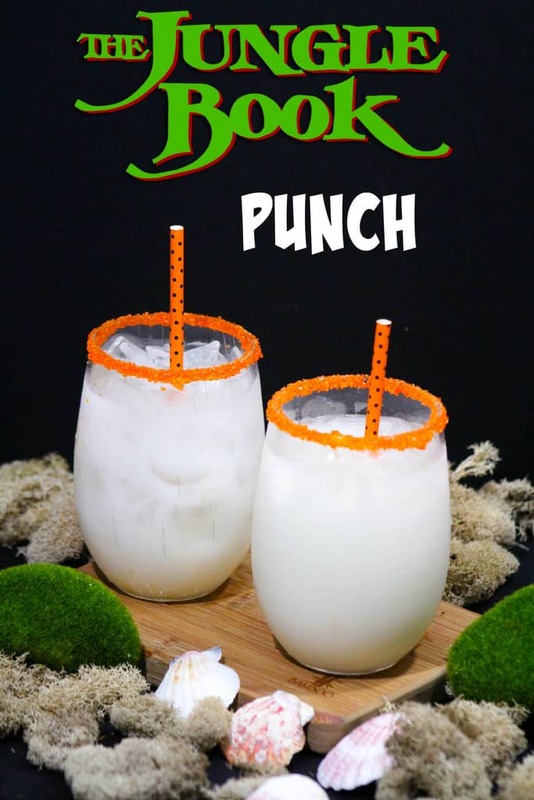 Try out Coconut Punch Drink for Kids inspired by the Jungle Book! Isn’t it cool? The BFG releases nationwide on July 1st, 2016. It’s just one of many fabulous family movies coming out this summer! I’m going to be spending a lot of time in movie theaters this year. I’m not complaining, at least they’re air conditioned! Thanks i cant wait to surprise the grandkids with this fun drink,thanks for sharing and have a lovely weekend ! Such a fun idea! My kids would love these! Thanks for sharing with the Delicious Dishes Recipe party this week! love this! will try this with my daughter, nice with the video too! This looks soo good and so fun for kids to make this summer! What an awesome idea! 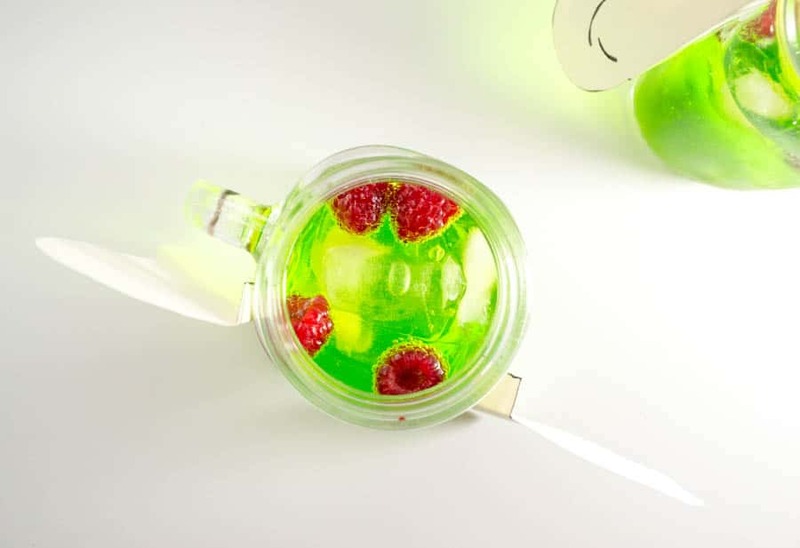 This is such a fun drink for the kids! Mine would love this and it looks easy enough to make. Ooooo what a fun drink! I bet my daughter would love this! THis is a cute idea. We might have to try it out. That drink looks amazing. My girls would have a ton of fun helping me make some of these. I’m sure they’d love to drink them as well. It sure looks good! Oh my gosh so cute. I love the fun color and those giant ears! This is such a cute idea and the flavor sounds great. You have to love those BFG ears! wow! looks so delicious and nutritious drink. and at the same time looks so refreshing! What a fun drink. I love the green color and the tasty ingredients, great for kids.